Orbital ATK developed the OmegA rocket to compete for national security launches. WASHINGTON — The U.S. Federal Trade Commission on Tuesday announced it has cleared Northrop Grumman's $7.8 billion purchase of defense and space contractor Orbital ATK. Orbital ATK will become Northrop Grumman's fourth business sector, named Northrop Grumman Innovation Systems. The other three are Aerospace Systems, Mission Systems and Technology Services. With the addition, Northrop Grumman's sales for 2018 should reach $30 billion. Blake Larson will serve as corporate vice president and president of Northrop Grumman Innovation Systems. As a condition for the approval of the merger, the company will have to supply solid rocket motors "on a non-discriminatory basis under specified circumstances," the FTC ruled. Ensuring competition in the solid rocket motors industry is a key issue for the Defense Department because only two manufacturers remain in the business, Orbital ATK and Aerojet Rocketdyne. The Air Force plans to acquire a new strategic intercontinental ballistic missile intercontinental ballistic missile, the so-called Ground Based Strategic Deterrent, with Northrop Grumman and Boeing competing for the award. The intent was for both Orbital ATK and Aerojet to supply both prime contractors. The FTC decision requires Northrop Grumman to separate its solid rocket motors business with a firewall so it can continue to support Boeing. Northrop Grumman announced the $9.2 billion deal on September 18. To buy Orbital ATK, it paid $7.8 billion in cash and assumed $1.4 billion in debt. Executives from both firms have pushed back on the idea that the combination reduces competition in the defense and space sectors. "Our two companies represent a very complementary fit," Northrop Grumman CEO Wes Bush told analysts. "We have very little overlap." Orbital ATK CEO David Thompson said last fall that the deal will give the company greater access to "technical and financial resources than we currently possess." The merger is coming to fruition as both companies move to increase their NASA and military space business. 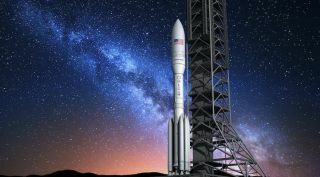 Orbital ATK in April unveiled a new intermediate to heavy lift rocket that was designed deliberately to compete for national security launches. Northrop Grumman recently secured a sole-source Air Force contract to develop next-generation missile-warning satellites.